Orgo II requires that you build on your knowledge of Orgo I — Organic chemistry is cumulative. Meaning that what you learned in Orgo I you must know in Orgo II. So if you need a refresher on Orgo I material, I suggest you do so prior to delving into Orgo II. Our Summary Guide and Exercise Sets are a perfect way to brush up on your Orgo I basics. StudyOrgo.com covers these beginning topics in a simple and easy to understand format. Many of them are available free of charge! Orgo II requires that the student be diligent and organized. As you learn the various reactions you will soon see that there is a lot to keep track of for each reaction. We suggest you be organized and disciplined and study a little each day. Take a look at how we organize our reactions— we suggest you do the same when you study and reference our material. As you study, be sure to establish connections in your mind on how the different reactions are related to one another. It is important to understand how you transition from one compound to another. This is especially useful in multi-step synthesis problems on your exams. For example, take a look at how we have organized the Orgo I reactions in our infamous Reaction Roadmap! Orgo II is your opportunity to soar in your organic chemistry studies. If Orgo I did not go so well or you struggled a bit- you are NOT alone! This is your opportunity to prove your organic chemistry skills. Many graduate school admissions committees specifically look at your grades in organic chemistry as it is known to be a challenging course. Aside from the actual grades in these courses, they will look at the trend- for example- did your grade improve from Orgo I to Orgo II? Maybe you got a B in Orgo I then got an A in Orgo II? That significant improvement from the first semester to the second semester speaks volumes to the potential of the student and is a great sign. So if you didn’t do as well as you wanted in Orgo I- don’t loose hope! A good grade in Orgo II can make all the difference! Our team at StudyOrgo.com is aware of these nuances and we are here to help you a long the way. 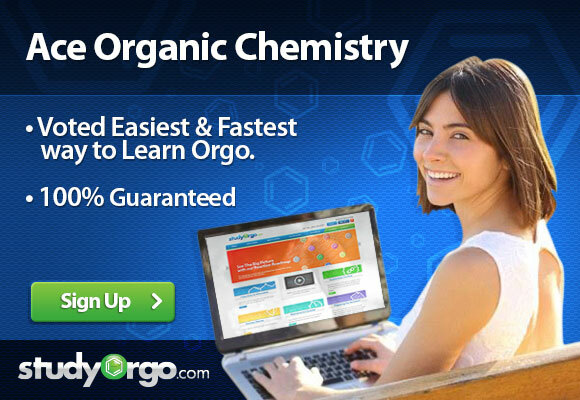 Sign-up and join StudyOrgo.com today! You can even take our tools on the go with our mobile app!